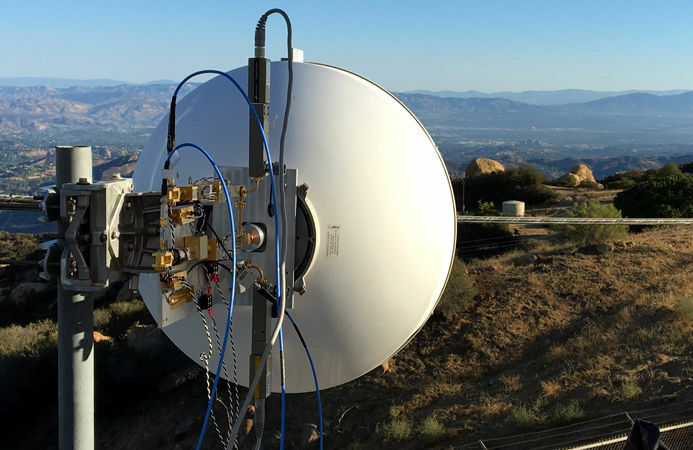 Earlier this year Facebook introduced terrestrial connectivity systems – Terragraph and Project ARIES (Antenna Radio Integration for Efficiency in Spectrum) in an aim to provide better internet connections in both rural and urban areas. Now the company has announced that it has demonstrated a record data rate of nearly 20 Gbps over 13 km with MMW technology. This uses custom-built components and is achieved by only using 105 watts of total direct current (DC) power consumption at the transmitter and receiver. “The transmission used a bandwidth of 2 GHz, resulting in an overall spectral efficiency of 9.8 bits per second per Hertz,” said Facebook. It said that this could be used as a terrestrial backhaul network to support access solutions like OpenCellular, or as a reliable backup to free space optical solutions such as the laser communications gimbal and optical detector in case of fog and clouds. It had several challenges, which it had to overcome by several custom-built components. Transmitter with cascade of custom-built MMW components attached to a commercial 2ft diameter parabolic antenna. Transmitter and receiver were separated by a distance of 13.2 km in Southern California. 4ft E-band antenna mounted on a 2-axis positioner for autonomous pointing and tracking on the receiver side. Fully integrated aerial payload with gimbal, capable of 20Gbps data rate in both uplink and downlink, tested in the 13 km link range. Aerial payload is mounted on a Cessna aircraft and is being flown at altitudes up to 20,000 ft testing first generation air-to-ground bidirectional link capable of 20 Gbps in each direction. Facebook said that the next generation air-to-ground communication system capable of supporting 40 Gbps each on uplink and downlink between an aircraft and a ground station will be flight-tested in early 2017.